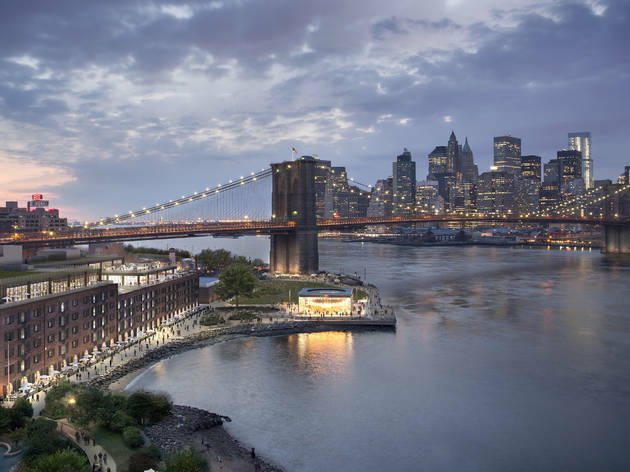 Time Out Market New York is set to open in spring 2019 in DUMBO, Brooklyn with a mission to bring the best of the city together under one roof: its best food, drinks and cultural experiences, based on the editorial curation Time Out has always been known for. Today, the first of twenty-one chefs and restaurateurs to join the food and cultural market have been revealed. It is a curated mix of the city’s award-winning chefs, the restaurants foodies can’t get enough of and much loved talent shaping New York’s culinary future. 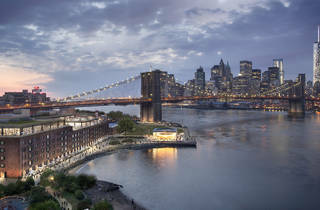 Located at 55 Water Street, Time Out Market New York will occupy two floors of the historic Empire Stores with its unique waterfront position right by the East River, offering a rooftop and impressive views of the Brooklyn Bridge and lower Manhattan skyline. Following in the footsteps of the wildly popular Time Out Market Lisbon—which opened in 2014 and with 3.6 million visitors in 2017 is now Portugal’s most visited site—the New York location will not only house twenty-one food offerings but also three bars, a performance stage, and an exhibition space. For fifty years, Time Out editors have been writing about the best food, drink and cultural experiences to help people make the most of the city; today, a global team is curating the best things to do in 315 cities in 58 countries across websites, magazines, social media, live events and now also Time Out Market. In 2019, this culinary phenomenon is expanding globally with five new Time Out Markets set to open in North America in Miami, New York, Boston, Chicago and Montreal. “New York is home to culinary and cultural excellence and diversity that is hard to find in many other cities,” shares Time Out Market CEO Didier Souillat. “At Time Out Market New York, we are dedicated to representing the wide breadth of talent—both iconic and up and coming—that makes up this vibrant city when it comes to food, drink and culture. It will be a place where you really can get to know and enjoy the city—all under one roof. Juliana’s: Patsy Grimaldi is a New York pizza legend—he learned to spin the dough at the age of 13 and worked in or owned pizza places all his life. In 2012, he came out of retirement at the age of 81 to open Juliana’s together with his late wife Carol and long-time friend Matt Grogan. Named after Patsy’s mother, Juliana’s is located in the DUMBO neighborhood right under the Brooklyn Bridge and ranks among America’s best pizza places. For Time Out Market New York, one of the city’s most celebrated pizzaiolos and his partner have teamed up again to prepare pizza with deliciously thin crusts and fine toppings from classic Margherita to rotating specials such as Scamorza Affumicata, Pancetta, Scallions and Oregon-Grown White Truffle Oil and of course, their Egg Cream which has become a New York institution in its own right. Reserve Cut: With Reserve Cut, Time Out Market New York will offer a fully kosher concept. Since it opened its doors in Lower Manhattan in 2013, Reserve Cut has redefined the kosher dining scene and its superior cuisine has established the restaurant as one of New York’s most notable modern kosher steakhouses. At Time Out Market, the team around founder and owner Albert Allaham—who also owns a butcher’s shop in Brooklyn and descends from a long line of master butchers—will blend their well-known approach to kosher fine-dining with new dishes such as House Spiced Pastrami, Slow Roasted Prime Beef, and Rosemary and Meyer Lemon Chicken Breast. Alta Calidad: Alta Calidad offers a creative and innovative take on Mexican cuisine. It quickly gained acclaim, garnering a Michelin ‘Bib Gourmand’ distinction in 2018 and 2019, upon opening in Prospect Heights, Brooklyn. Chef/Owner Akhtar Nawab felt the distinct similarities between the cuisines of Mexico and India—his parents’ native country. Having grown up learning to cook with his mother as his culinary inspiration, for Alta Calidad he created a marriage of the two cuisines with exciting flavors and satisfying standout dishes. At Time Out Market, he will showcase a version of a Roti through a Mexican lens. Perfect for sharing. The must-have Tacos are Crispy Tempura Shrimp and Chipotle Remoulade or Charred Beef Brisket with Crispy Queso and his well-known, meaty Chicken Fried Steak Torta. Miss Ada: Chef and Owner Tomer Blechman marries his childhood memories of cooking with his grandma and grandpa in Tel Aviv and his experience working in revered New York restaurants at Miss Ada—a play on the word ‘misada’ or ‘restaurant’ in Hebrew. The result is an exquisite, unique twist on modern Mediterranean cuisine which turned this charming and buzzing restaurant in Fort Green, Brooklyn into a much loved neighborhood staple and just recently earned it a Michelin ‘Bib Gourmand’. Chef Tomer’s menu at Time Out Market will feature a selection of sumptuous creations including Hummus/Mezze Platters, a Pita Sandwich, Hummus Bowls with a variety of bases (think Spring Pea and Sweet Potato) and loads of fresh toppings such as Tabbouleh or Israeli Salad. Bessou: Owner Maiko Kyogoku and Executive Chef Emily Yuen will bring the first expansion of their NoHo restaurant Bessou to Time Out Market. Inspired by the Japanese family recipes Maiko grew up with, the team will showcase a more casual spin on Bessou. The mouthwatering menu will include options like Bento Bowls with Miso Roasted Salmon, Fried Chicken Karaage with Scallion Aioli or Tempura Udon; Crispy Rice Onigiri with Spicy Tuna, Mushroom Tomato with Wasabi Aioli, or Japanese Curry; and the classic rice ball Onigiri redefined with Tonkatsu Pork Cutlet or Soy Koji Roasted Chicken. Clinton St. Baking Company & Restaurant: New York’s beloved hot spot, Clinton St. Baking Company & Restaurant, offers eclectic takes on classic American food and melt-in-your-mouth pancakes which cause two-hour weekend waits at their Lower East Side restaurant. Co-Owners Chef Neil Kleinberg and DeDe Lahman will serve their greatest hits such as Neil's famous Pancakes with Warm Maple Butter, Spanish Scramble with Chorizo and Eggs Benedict at Time Out Market. There will also be brand new dishes such as a Brioche French Toast with Blackberries, Lemon Curd and Fresh Blackberry Syrup and fan favorite, Raspberry Jam Pancakes, which appear on the Clinton St. menu only once a year. FELICE: Since forming over a decade ago, ​​​FELICE Restaurant and Wine bar, part of SA Hospitality Group, has become neighborhood staples with three locations on the Upper East Side and one in the Financial District. As the first Brooklyn outpost, FELICE PASTA BAR will bring the authentic flavors of Tuscany to Time Out Market with their fresh antipasti and pasta they have become recognized for. Guests can expect to enjoy craveable dishes such as Gnocchi Cacio e Pepe or Lasagna alla Chiantigiana, homemade Fettuccine alla Bolognese, Tagliolini al Pesto, and several new vegetarian and vegan options. In addition, their signature soups, Zuppa Contadina and Pappa al Pomodoro will be served up and every day, there will be off the menu dishes such as special pasta. Jacob’s Pickles: Owner Jacob Hadjigeorgis and his team have been dedicated to southern-style comfort foods at Jacob’s Pickles ever since opening in 2011. An Upper West Side destination, Jacob’s love for bringing people together over home-cooked food is an experience he will bring to Time Out Market, together with the warmth and charm of his artisanal back-to-basic dishes. Entering Brooklyn for the first time will be his famous abundant and flavorsome Southern Biscuit Sandwiches with Honey Chicken & Pickles or Sausage Gravy Smothered Chicken along with Mac & Cheese and a selection of sides such as Organic Cheese Grits, and, of course, Pickle Jars and Fried Pickles—all followed by Jacob’s famous Fried Oreos. DŌ, Cookie Dough Confections: When founder and CEO Kristen Tomlan opened the doors to her gorgeously colorful Greenwich Village store in 2017, endless lines have snaked around it instantly, eager to enjoy her gourmet cookie DŌ treats—scoops of safe-to-eat raw cookie dough served like ice cream. Ever since, DŌ’s loyal following continues to grow not least because the indulgent little creations have become an Instagram favorite. Here are some of the whimsical cookie dough flavors that will make Time Out Market a cookie dough lover’s dream: Cake Batter (sweet vanilla cake base with colorful sprinkles, chocolate chips, and white chocolate chips), Brookie Dough (a decadent combination of Brownie Batter and Signature Chocolate Chip, swirled together in the same bite) or S'mores (Signature cookie dough with milk chocolate pieces, toasted marshmallows, and crunchy graham cracker pieces). All of these varieties (including some gluten-free and vegan options) as well as a rotating seasonal flavors will be available as Cookie DŌ Scoops, Cookie DŌ Krispies, Cookie SanDŌwiches, Cookie DŌ Pops and more. Avocaderia: Francesco Brachetti and Alessandro Biggi founded Avocaderia on the principles of offering people a healthy, tasty and fun meal, using a particularly popular fruit in every dish—the avocado. Time Out Market will be the third location of Avocaderia and, similar to the Industry City and Chelsea locations, will be serving up delicious toasts and nourishing bowls, guacamole and more—made from organic avocados from Mexico. All-avo menu highlights will include the Burrata Dream with Kale Pesto, Avocado Rose, Burrata, Pistachio Dukkah, Black Pepper, Za’atar Olive Oil and Balsamic Vinegar on Multigrain Bread and the My Thai with Arugula, Raw Cabbage, Carrots, Bean Sprouts, Avocado, Watermelon Radish, Cilantro and Spicy Miso Dressing. Closer to the opening, Time Out Market New York will announce the next additions to this curated mix as well as how local art and culture will be part of the unique experience. After exploring and sampling a variety of dishes—served on fine china with flatware—from the surrounding kitchens, family and friends come together to enjoy their meals at communal tables in the center of Time Out Market.